Bill Nye was interviewed by CNN after possible 2016 presidential candidate Senator Marco Rubio stated that “the age of the universe has zero to do with how our economy is going to grow” and that the dispute over the question “has nothing to do with the gross domestic product or economic growth of the United States.” (Be sure to read the complete quotation and last week’s analysis of Rubio’s remarks) Nye, a popular children’s television personality, is an outspoken evolutionist and secular humanist who has made dire predictions that American progress will grind to a halt if American children fail to accept evolutionary ideas. Nye, claiming earth is 4.54 billion years old, mixed up historical science with experimental “here and now” science in his attempt to build a case for the economic relevance of evolutionary thinking. Both Nye and the CNN interviewer used this convenient conflation of concepts in an attempt to discredit Rubio’s statement. 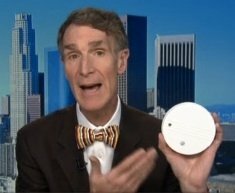 Bill Nye tries to use present-day technology that depends on present-day experimental science to support his contention that America’s economic future depends on Americans believing the earth is 4.54 billion years old. Smoke detectors typically contain a radioactive isotope (americium-241). The alpha particles it emits ionize the air in the detector. The ionized air completes an electrical circuit. Smoke disrupts the circuit because ions stick to smoke particles. Production of this technology has nothing to do with a belief in billions of years or knowledge of earth’s age but only with the observable behavior of radioisotopes today. Image credit: video interview of Bill Nye at www.cnn.com.
. . . has nothing to do with the gross domestic product or economic growth of the United States. I think the age of the universe has zero to do with how our economy is going to grow.